Election: What do the parties say? In this 2017 Queensland State Election campaign, CANEGROWERS has urged the political parties to commit to actions which will secure the livelihoods of the tens of thousands of people who rely on the sugarcane industry. The actions included cutting electricity prices, maintaining grower choice in sugar marketing and supporting environmental sustainability programs without regulating farm practices. They are detailed in the CANEGROWERS issues and actions brochure. 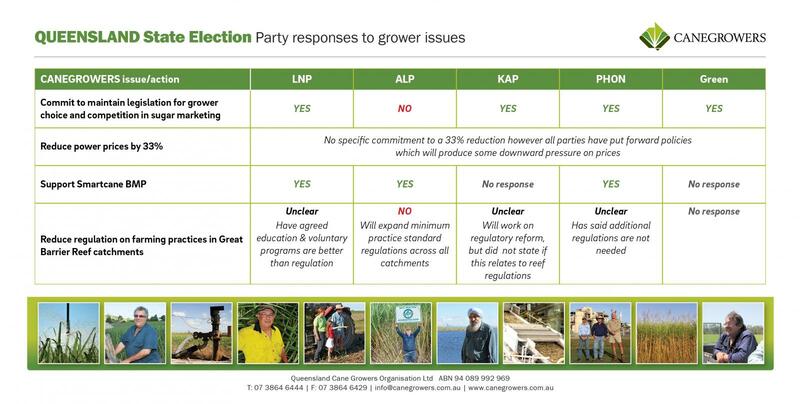 On 3 November, CEO Dan Galligan wrote to the parties listing the issues and actions important to members in this campaign and across the cane growing districts, CANEGROWERS staff and elected representatives contacted local candidates. Click on these links to download and read the responses to the CEO's letter from the Liberal National Party, Australian Labor Party and Pauline Hanson’s One Nation.